Managua (Fides) - Tomorrow, February 27, dialogue between the government and representatives of the opposition will resume in Nicaragua. 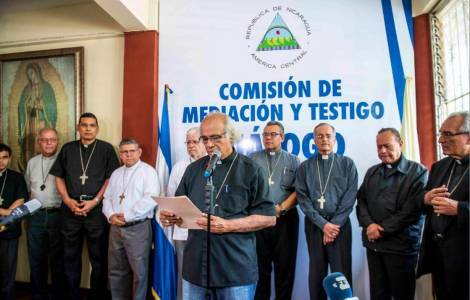 Representatives of the Episcopal Conference will sit at the negotiating table, as witnesses and mediators alongside the representatives of the government and the delegation of civil society. Among the news sent to Fides in recent days, there is also the private meeting in the Vatican between Pope Francis and Cardinal Leopoldo Brenes, Archbishop of Managua, chairman of the Episcopal Conference. In the past, the Cardinal had repeatedly told the Pope about the situation in the Central American country. In January, the entire Episcopal Conference of Nicaragua met the Pope at the World Youth Day in Panama. A few days ago (see Fides 21/02/2019), the Apostolic Nuncio, Archbishop Stanislaw Sommertag, together with Cardinal Brenes, took part in a meeting of government representatives with the country's entrepreneurs, and focused on the current crisis. The final statement states: "The open exchange of views confirmed the need for inclusive, serious and open negotiations".